The first of the wind turbines off the Sussex coast has started spinning and generating power. Rampion offshore windfarm saw the first of its 116 turbines put online last night (Sunday, November 26). One by one the rest of the wind turbines will be activated, until the windfarm is fully operational next year. Matthew Swanwick, Project Director for the Rampion Offshore Wind Farm said: “We’re especially proud to have reached this milestone as the first power is generated at Rampion. The wind turbines were installed 13km off the coast over a period of six months this year. Once fully operational in 2018, the windfarm will generate enough electricity to supply around 347,000 homes – the equivalent of around half the homes in Sussex. Power will travel from the windfarm to a substation in Bolney where it will be accepted into the transmission grid. The windfarm, which is built by E.ON, the UK Green Investment Bank Ltd and Canadian energy infrastructure company Enbridge, will produce a target capacity of 400MW. Earlier this month, the project announced a £4 million Community Fund with the largest element, the £3.1 million Rampion Fund, earmarked for community projects. 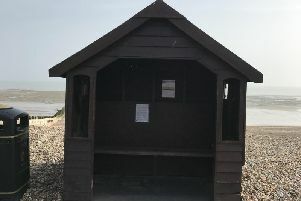 This fund is being managed by Sussex Community Foundation, which said it is already experiencing a high level of local interest.